Dental crowns are meant to restore cracked or damage teeth, which will not heal naturally on their own. If you experience sharp pain when biting down, it’s a good sign that your tooth needs a crown to prevent future cracking and oral bacteria from getting inside. Be sure to ask your dentist to confirm that your tooth is in fact cracked and not simply showing craze lines. Craze lines are purely aesthetic, harmless, and commonly appear in back teeth. However, they are a sign of stress and can develop into cracks if they exhibit deep staining. While nothing may happen if you choose not to get a crown, it’s unlikely that your dentist will recommend you take that risk. It could crack worse after enough force is applied to it. In rare cases, a root canal may be needed if bacteria reaches inside and infects the pulp. In the worst case scenario, the crack could split so much that an extraction becomes necessary. Depending on the extent of the damage, you may be able to opt for a dental filling rather than a full-blown crown. 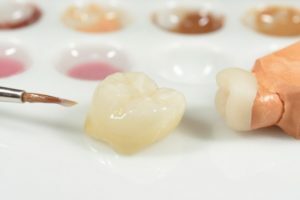 However, a filling will not completely remove the possibility of needing a crown later, especially if the crown is large. A general rule of thumb is if the filling makes up 2/3 of the tooth or more, it should be covered with a crown. Do I Need a Crown Because of My Large Filling? Large fillings are more likely to cause the tooth to crack further, requiring a dental crown later anyway. This is especially true if the filling Is made from amalgam and not composite resin. If the tooth breaks significantly, it will be irreparable and need extraction. The only time a tooth would require a root canal is if you have signs of an infection or if a crack extends below the gum line. Present infections need to be treated right away to prevent future damage to the mouth, while extensive cracks can leave the tooth extremely vulnerable to infections. Staying informed is only part of receiving good dental care. Schedule an appointment today to learn if a dental crown in Yuba City is necessary for your case! Dr. Ajaipal Sekhon earned his Doctor of Dental Surgery degree from the University of Western Ontario. He ensures patients that their restorations will be the same shape, size, and color of their existing teeth. This will allow it to function and appear as naturally as possible. To learn more about his practice, contact him through his website.